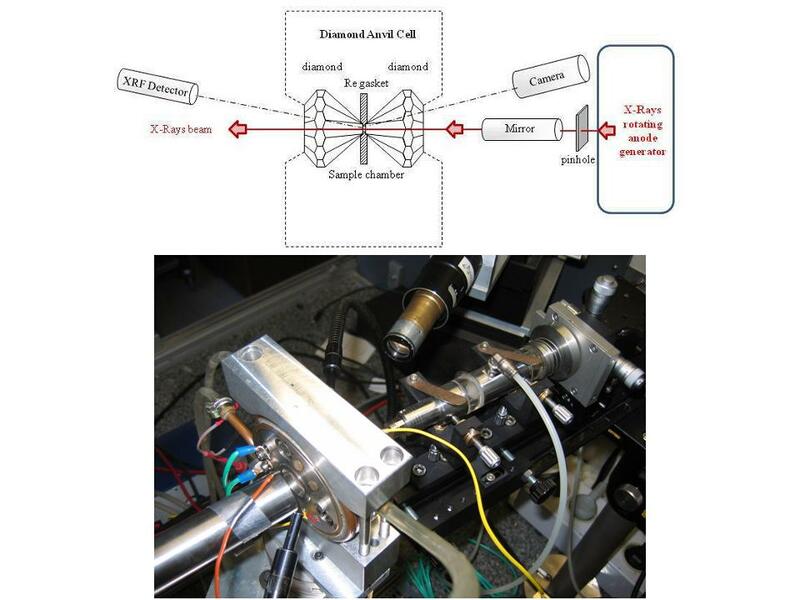 In the frame of a collaboration between LAPA/SIS2M (UMR 3299 CEA-CNRS) and the Laboratoire Métallurgies et Cultures, Institut de Recherches sur les Archéomatériaux (IRAMAT UMR 5060 CNRS), it was jointly developed several experimental setups on a rotating anode X-ray generator. The particularity of the generator, besides the fact that we can obtain a flux well above conventional X-ray source, is the two independent x-ray output windows, thus allowing us to develop two setups. First of all, both outputs are equipped with a FOX 2D Mo 25-25P focussing multilayer optics (Xenocs®), providing monochromatic x-rays around the Mo Kα1,2 lines (17.5keV). The spectral purity of the beam is more than 97% and the Kb contamination is less than 0.3%. Setup 1: the optics delivered a 100µm diameter X-ray spot with an estimated flux around 33.6.Mph/s at the sample position. X-Ray Diffraction on thin samples and powder is allowed thanks to an imaging plate placed behind the sample. In the same experiment, it is possible to acquire X-ray fluorescence spectra in order to obtain major and trace elements composition. In-situ reduction experiments can be achieved. For example electrochemical cell are coupled to this setup, allowing to monitor phase modification under electrochemical solicitations. 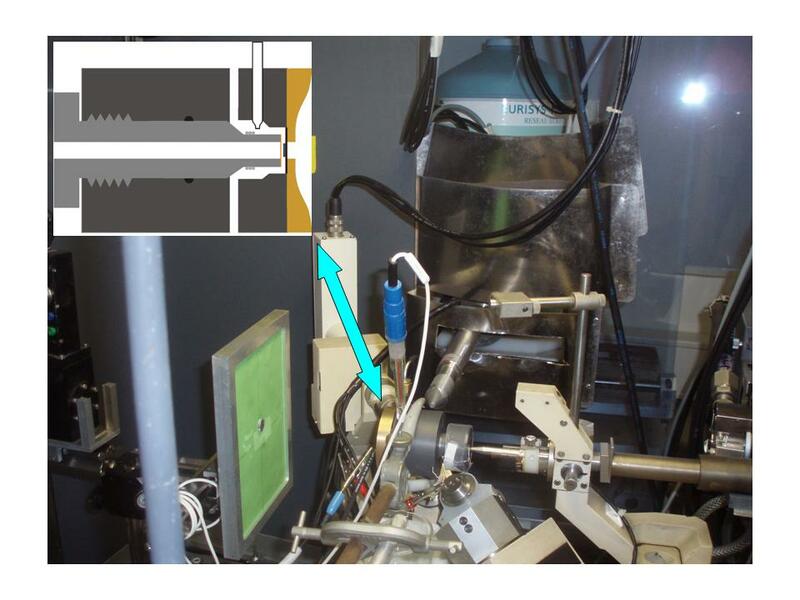 Setup 2 : a toroïdal miror delivers a 30µm diameter X-ray spot with an estimated flux around 1 Mph/s at the sample position. 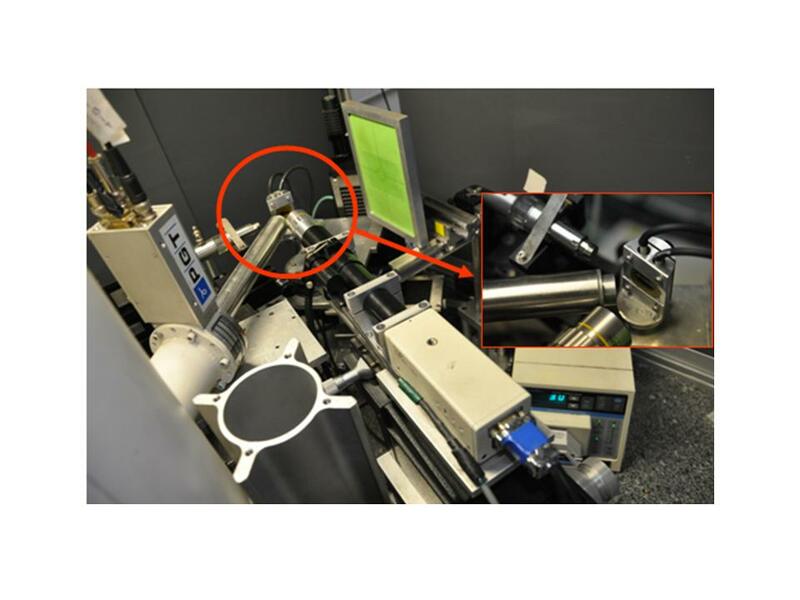 This smaller beam size is obtained by putting a 30µm diameter pinhole nearby the x-ray exit window and thus imaging this "secondary" source through the multilayer optic instead of imaging the 100µm diameter initial x-ray source. Also, with this setup we can have different modes of analysis. 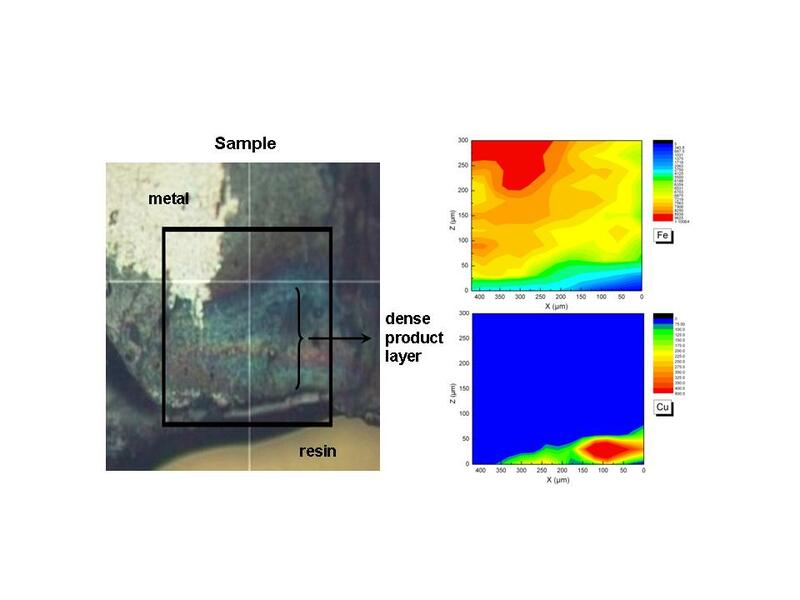 Recently, a specific setup was develooped allowing to monitor in situ the structural evolution of the corrosion pattern in aerated NaOH solutions during the dechlorination processes of marine iron artifacts. The XRD pattern is then collected in reflection mode with the sample placed at less than 5° compared to the incident beam, thus the beam spot size is estimated to be around 600µm large and 30 µm high.